M. Leet for MBARI © 1997. D-Lib Magazines featured collection this month is the MBARI web site. The Monterey Bay Aquarium Research Institute (MBARI) is a private, non-profit research center, founded in 1987 by David Packard, with the stated mission: "to achieve and maintain a position as a world center for advanced research and education in ocean science and technology, and to do so through the development of better instruments, systems, and methods for scientific research in the deep waters of the ocean..."
The David and Lucile Packard Foundation provides the funding for MBARI, and the institute president and chief executive officer is Marcia K. McNutt. Dr. McNutt manages a staff of 190 comprised of scientists, engineers, and operations and administrative personnel. © 1999 MBARI, Used with permission. The MBARI web site provides open access to a wealth of valuable and interesting oceanographic information. In the "News" section of the MBARI web site, you will find much more than the listing of news releases. It is in this section that you will find educational resources like Cruise into the Classroom where you can vicariously take part in the scientific expeditions, perusing daily logs and images from past and present cruises. MBARI presents weekly seminars that are open to the public and cover a wide range of topics related to deep-ocean research and engineering. Seminar speakers are scientists and engineers from all over the world, as well as from MBARI. Another section of the MBARI web site is Data & Images. Though data and images can be found in many places on the MBARI website, the directory on this page leads you to the major resources, including charts, graphs, photographs, video and more. 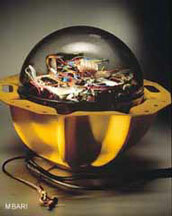 The Research and Development (R&D) section provides information regarding current MBARI projects; a listing of staff with links to their web pages; a bibliography of MBARI publications and peer-reviewed publications by MBARI scientists and engineers; a description of research organized by subject; and a page devoted to a description of recent MBARI developments. © 2001 MBARI. Used with permission. You can use the Search page to search the MBARI web site. Boolean searching is an option, and you can request that the search results be displayed in either long or short formats, and sorted by relevance score, title or time. There are so many resources available at the MBARI web site that it would be difficult to describe all of them. It would be much more enlightening and fun for you to "surf" the MBARI web site for yourself. The home page for the MBARI web site is located at http://www.mbari.org/.